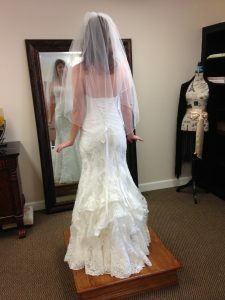 Roxie did an absolutely beautiful job on my friend Molly’s wedding dress! She really customized the look and was so thoughtful to what Molly wanted and how she could be comfortable. I was the assigned bustle-girl and went to two of the fixings with Roxie. Both fittings Roxie remained incredibly professional and sweet, she really treats you like a friend. I absolutely love Roxie and hope to use her as my seamstress for my wedding this coming May! If you want your dress to be absolutely perfect, if your dress is made of delicate lace, or you want an incredible bustle even if you don’t have a very long train, this is the seamstress for you! She is wonderful!